Posted December 19, 2012. More thoughts on drugs. People with Lyme disease and Lyme symptoms are not only taking painkillers, but some of these psychotropic drugs too. Again, I’m not saying don’t take any drugs! I’m only encouraging people to consider all risks carefully before taking these types of psychiatric medications. I have a friend who gives her son phsychotropic medications with a Black Box warning, because he “can’t concentrate.” Then he has Red Bull with his lunch. Many people with Lyme and Lyme symptoms are taking a lot of pills. Sometimes these drugs are necessary, but we all should be very careful and give any drug thoughtful consideration. If you suffer from psychiatric distress from Lyme or Lyme symptoms, discuss these issues with your LLMD. Very good article below….Read on…. We are deeply saddened about the tragic events in Newtown last week. In events like this politicians immediately seek to blame guns but never medication. This article raises the issue of considering gun control AND medication control. 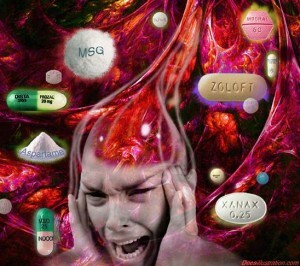 We Should Be Outlawing Psychiatric Medications! Medications kill roughly 100,000 Americans each year according to statistics. The actual number is either 98,000 or 106,000 depending on which study you believe.For guns to be as deadly as medications, you’d have to see a Newton-style massacre happening ten times a day, every day of the year. Only then would “gun violence” even match up to the number of deaths caused by doctor-prescribed, FDA-approved medications.If our goal is to stop the violence in America, we are completely dishonest if we do not consider the mental causes of violent behavior. And that starts with mind-altering psychiatric drugs which I believe have unleashed a drug-induced epidemic of violence across our nation.Obama, Bloomberg and others will point to guns and try to convince you that inanimate metal objects are the cause of this violence. No guns shoots itself. The trigger must be pulled by someone, and the mental state of that person is the primary cause of the resulting action. To ignore this fundamental chain of facts is brutally dishonest.